Maria Luisa Martín was a refugee from Spain who emigrated to Mexico in 1939. In 1944 she enrolled in La Esmeralda Academy. She had her first solo exhibition in 1950. 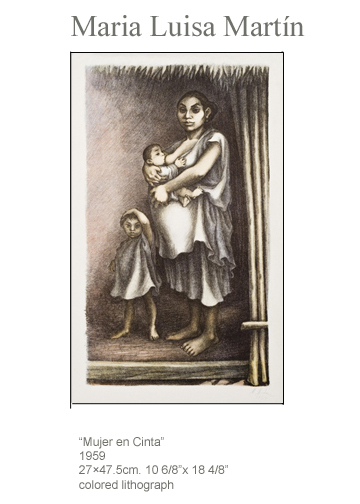 She assisted Diego Rivera in the painting of the murals at Ciudad Universitaria (campus of the Mexican National Autonomus University), and at the Insurgentes Theater. From 1950 to 1953 she was a guest artist at the Taller de Gráfica Popular . From 1955 to 1965 she was a full member of TGP. She traveled to Eastern Europe and China. She taught Art-Drawing- at the School of Arquitecture at the Universidad Autonoma de Mexico.